A vigil in honor of Bob Arihood, the East Village photographer who died on Sept. 30, included notable neighborhood characters like Ray Alvarez of Ray’s Candy Store, Jim “Mosaic Man” Power, graffiti artist Chico, L.E.S. Jewels, activist and photojournalist John Penley, and documentarian Clayton Patterson. Tonight at 7:15 p.m., friends of Bob Arihood and admirers of his work documenting the daily life of the East Village will gather at Lucy’s, with a candlelight vigil to follow at 8 p.m. at Ray’s Candy Store. Today, his body is being returned to his hometown of Lafayette, Indiana. According to Leslie Arihood, his younger brother, funeral arrangements have been tentatively set for Sunday at the Soller-Baker Funeral Home. “What made Bob special was that he listened to people,” said one of the three men who found Mr. Arihood’s body on Friday, adding that Mr. Arihood was more inclined to hear someone’s life story than to tell his own. Phillip Kalantzis Cope Mars Bar closed its doors Monday. It happened a little before 4 p.m. The patrons were let out, the door was shut. And with the resignation of a whimper in place of the much anticipated bang, Mars Bar closed, forever. On any other afternoon, the iconic bar — a symbol of a time gone by for a neighborhood experiencing an era of commercial development — would be sprinkled with regulars yakking away about the day’s gossip with a sympathetic young bartender. Debates over the distinction, if any, between bands like Foreigner and Journey would be overheard as music from John Fogerty to Wesley Willis bounced off the bar’s graffiti-laden walls. Glasses of whiskey and discount red wine would be filled to the top, and the beer was always served ice cold. But by late Monday afternoon, Mars Bar had finally served its last drink. Raymond Bell, 60, a longtime regular with a taste for red wine, described being on the scene Monday afternoon when the New York City Department of Health and Mental Hygiene closed the bar down — only a few weeks before the building’s demolition to make way for a new 12-story condo. We begin the week on a somber note. The neighborhood paused in remembrance Saturday night, as friends gathered for a vigil in honor of Monica Shay, an East Village resident and Pratt Institute professor who was killed last week. The event turned into a protest of sorts as participants celebrated Ms. Shay’s longtime community activism. Ms. Shay’s nephew and a toddler were also killed in the shooting. Ms. Shay’s husband and another victim in the shooting remain in critical condition. Two other members of our community will be celebrated and remembered tonight. Friends and family will gather in Queens for a visitation for Dominique Philbert, who died last week. Mr. Philbert worked with his father, George, at Bikes by George on Fourth Street. In traditional New Orleans fashion, friends of Ray Deter, the d.b.a. bar owner who died from injuries sustained in a biking accident, will take part in a second line funeral march beginning at 7 tonight — a fitting tribute for Mr. Deter who also owned two bars in the Big Easy. 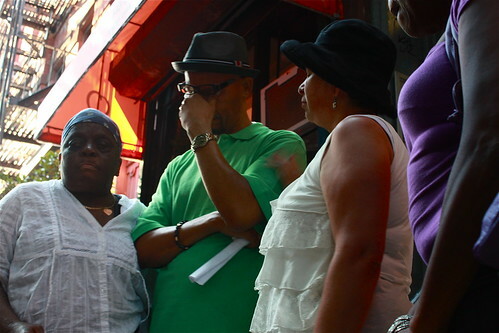 Vigil Held for Local Family Shot in Pa.
Chelsia Rose Marcius Nicholas Heyward, 54, of Boerum Hill, Brooklyn, a member of the October 22nd Coailition to Stop Police Brutality. Old friends, neighbors and passersby gathered by the front stoop of 263 East 10th Street between First Avenue and Avenue A for an evening vigil at the house of Monica and Paul Shay, the East Village couple who were both shot in the head Saturday night at their country house in Bechtelsville, Pa.
“If he had the chance to talk first, he probably would have talked” — the gunman — “out of it,” said friend Paul DeRienzo, 55, of the Lower East Side, who said Mr. Shay always found a way to temper a dispute and help warring parties make peace.